It is a common misconception that simply because an area is a village, that it is small, quiet and contained. We know that villages such as Cranleigh are some of the largest civil parishes in the UK with bustling and thriving businesses and many residents as well constantly developing areas. So it stands to reason that in places like Cranleigh skip hire is a genuine waste disposal need; requiring a competitive and reliable supplier. We at Fastways are here to meet that need. Being experienced in working in the Surrey and West Sussex areas we have the localised knowledge and the capacity to be efficient, personable and yet flexible enough to meet your skip hire needs; whatever they may be. From individuals moving home, to large firms constructing new industrial developments; we know how to tailor our skip hire service accordingly – without our customers breaking the bank to afford it. 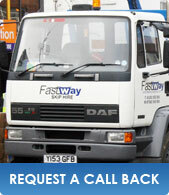 Contact us today to see how Fastways can provide high quality services to Cranleigh customers at maximum value.